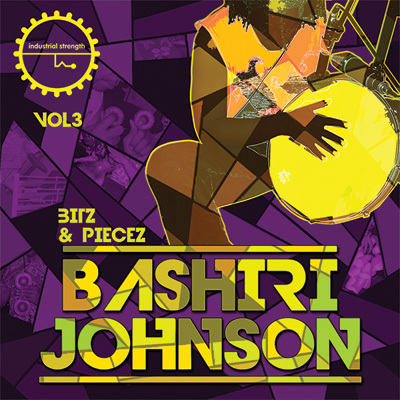 Percussion legend Bashiri Johnson returns to Industrial Strength samples with this fresh onslaught of groove-inducing live drum and percussion samples. Delve into Johson's personal collection of rare world instruments and unearth the essential pulses that have kept the people of Earth dancing since the dawn of humankind. Bitz & Piecez Vol. 3 features more than a gig of original one-shots and loops from one of the planet's most sought-after percussionists. This extensive pack brings together sounds from around the globe, as Johnson unites the rhythms of the continents and delivers them straight to your Daw of choice. any style of Electronic Dance Music. NYC veteran beat maven Bashiri Johnson is revered by producers and stars for his soulfulness and intuition. The Bash-man's versatility and uncut originality have led to hundreds of credits as a studio guru, songwriter, and fabled live performer. Bashiri has performed and recorded with the likes of Beyonce, Jay-Z, Michael Jackson, Madonna, Whitney Houston, George Michael, Carol King, James Taylor, Aretha Franklin, Miles Davis, Brandy, Eric Clapton, and The Rolling Stones. The epic list continues. This precise and powerful percussion soundest was recorded by NYC's famed Roc Isaacs, who put to tape such names as Run DMC, Mary J. Blige, and Ziggy Marley. Isaacs and Lenny Dee rendered the cream of Bashiri's collection in glistening 24-bit, 44.1kHz samples, formatted in Wav, Apple Loops and Rex.2 for total versatility. The amazing set of Percussion Shots included this pack are ready to lock in load in Native Instruments Maschine. The stunningly comprehensive Bitz & Piecez series includes three volumes, each bursting with its own stash of percussion samples. Check out Bitz & Piecez Vol. 1 and Bitz & Piecez Vol. 2 for the complete collection of organic effects and home-grown grooves. Get rhythmic, get global, and breathe your own sound into these bitz and piecez.